My name is Dane Clark. I’m a sophomore (class of 2017) Near Eastern Studies and Archaeology double major with a minor in classics. I have previous experience working with ancient materials digging in an archaeological excavation and restoring ceramics in a conservation lab. I expect that this class will offer an important new way of looking at the materials that I’ve been working with, focusing more on the production instead of the product. The class at their wheels, watching Matt Hyleck throw a bowl for a kylix. “The production of wheel-made pottery requires a high degree of manual dexterity and a continual application of artistic judgment. The form must evolve slowly, but not too slowly or it will collapse, and it has to be developed to its final state through a series of intermediate steps.”–Joseph V. Noble. 1988. The Techniques of Painted Attic Pottery. Revised ed. London: Thames and Hudson. pg. 24. 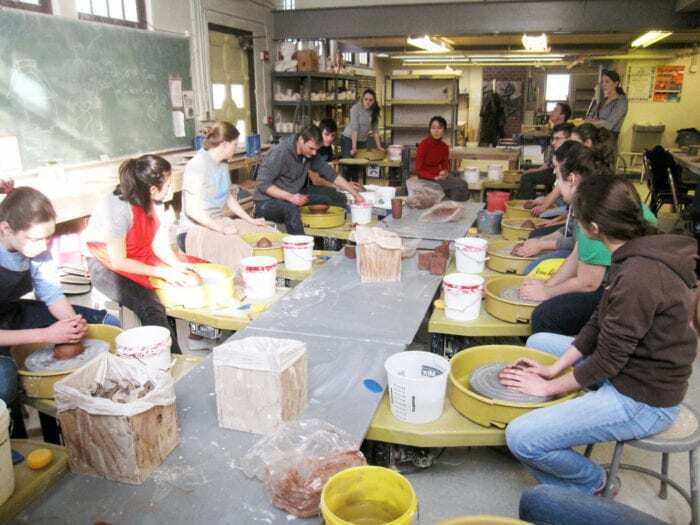 This fourth class was divided into two segments: a lecture by our T.A., Ross Brendle, on the iconography found on ancient Greek ceramics, and a head-first plunge into the world of pottery throwing. Ross’s lecture made sure that we were well acquainted with the many terms and concepts involved in analyzing ancient Greek vessels. We started with identifying the part of a Greek cup that we are most concerned with in terms of iconography: the tondo. The tondo is the circular, decorated area inside the bowl of the cup, where pictures are most commonly found, though they are also frequently found on the outside. At around 530 B.C.E., with the advent of the red-figure technique, decoration on the interior of the cup was primarily contained within a circle at the bottom of the bowl. However, moving along into the 5th century B.C.E., painters began to gradually push the limits of their scenes by expanding outward and filling up more of the cup’s interior with their designs, all the while both decreasing the depth of the bowl and increasing its width. Eventually, the scenes fill up virtually the entirety of the interior and, in some instances, the cup becomes so shallow and so wide that it is essentially a plate, at which point some cups lost all functionality. The most common motifs found on red-figure vessels include depictions of athletics, scenes of symposia, and scenes from mythology. Because of the significance and prominence of wine in symposia, Dionysus (the god of wine) was a very common figure to be portrayed. One of the amazing things about these images is their incredible detail. How exactly the ancient painters were able to produce such elaborate and finely detailed pictures is not exactly understood, however some scholars believe that the ancient painters may have applied the slip using a special sort of brush, possibly only consisting of an individual hair from an animal like a horse or boar or even the whisker of a cat. This information was especially important to keep in mind as we prepared to start throwing, because we would eventually have to create some kind of image in the small, awkwardly-shaped section of our own bowls. Ross Brendle tries his hand at throwing a kylix bowl on the wheel. Our next task was to begin throwing the pots. With only a few students having previous experience throwing pots, this was a wildly new experience. Matt began by repeating his demonstration of wheel throwing he had given us the previous week. After that, our time had finally come to begin throwing on our own. We started by cutting slabs of clay from the blocks, and then quartering them to get the size that we wanted to use to throw. Throwing turned out to be far more difficult that it looked. Even simply centering the lump of wet clay on the spinning wheel proved a difficult task for many of us. If the clay wasn’t centered, it would begin to wobble and adamantly protest as it spun. The more out of center it was, the more uncooperative the clay became. While watching an expert potter like Matt at the wheel, the clay seemed to move so smoothly as he centered it, brought it up into a cone then back down, and then opening it into a bowl, all with effortless grace. However, as a first time thrower, my own finesse and grace seemed to be considerably lacking. 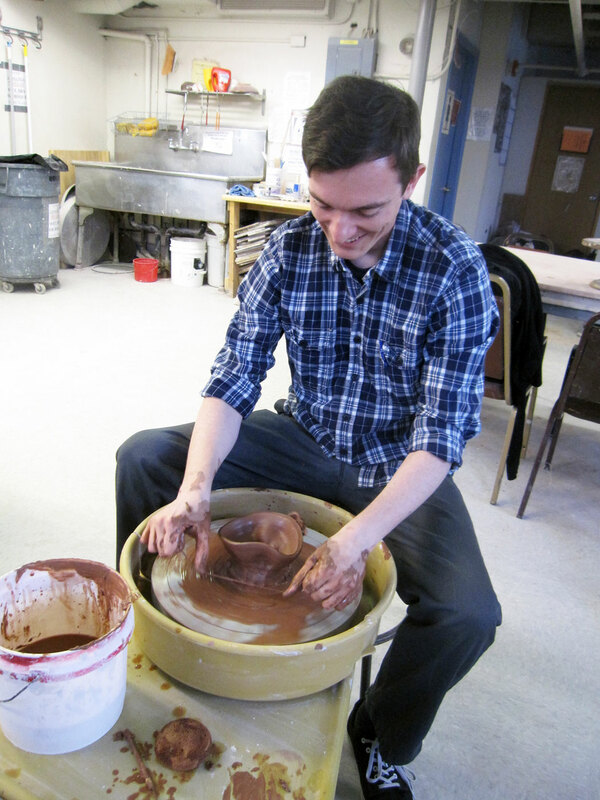 While Matt seemed to guide the clay with such ease, it turned out that there was a significant amount of physical exertion required to form the shapeless clay into anything remotely resembling a bowl. As the end of class drew near, those who managed to successfully make bowls cut them from the wheels with wires, and those who were less successful squished theirs into lumpy arches to dry before being reused. As frustrating and exhausting as this was, it was a mere taste of what it would have been like to learn how to throw ceramics as an actual apprentice in ancient times who would have worked day-in and day-out, tirelessly devoted to learning the craft. Ross Brendle’s lecture at the beginning of class on imagery really got me thinking about artistry and how much artistic ability played into the production of these vessels. According to Ross and Matt, the imagery was composed in minute detail and with individual strands of horsehair. While obviously neat and carefully executed, we have learned these were also mass produced with incredible ease and speed! If we are able to even replicate such artistry, let alone come up with our own designs, imagine how long it will take to get it right! And we have even fewer opportunities to practice. While I was able to throw one bowl successfully, I have no idea how painting will go, or even how we will approximate the painting tools of the ancient Greeks. Another thought, we are able to ascertain certain trends in designs on kylikes: ranging from feats of athleticism (long jumpers) to debaucherous (Dionysus and his harem) and more explicit, sexual images (this was unexpected and a bit shocking for such a public item!). Professor Balachandran has asked us to consider contemporary interpretations of these images. I guess the modern iteration of the wine kylix would be the glass beer mug. In this case, I would say the most common feature of beer mugs is the logo of a sponsoring/advertising beer company. Now, We must remember that painters were quite vain about their signatures and usually featured them prominently on the tondo. Is this similar to modern commercial branding when we consider the mass production aspect of Greek kylikes? Thanks Dane for the post! It’s true that the iconography on grecian kylixes are remarkably beautiful and detailed. However, some of the chosen images were a lot less flattering than the workmanship put into them. I’ve always imagined ancient Greece as an almost crystalline time of beauty and renaissance and scientific genius, but seeing scenes of vomit and urination depicted on drinking vessels sobered me up. Imagine going to a cocktail party holding a cup with a picture of someone throwing up on someone else. Athenians must have had a very different interpretation of manners than we do nowadays. Although, I’m definitely looking forward to the images we all decide to pursue next week! For me, it was interesting to think about our throwing attempts (especially the failed ones!) in relation to the formation of the archaeological record. Seeing all the arches that had been failed attempts set out to dry so that they could be reused made me realize that the learning curve of the apprentice potter is something that would not be represented archaeologically, as the mistakes would simply be recycled. The reusable nature of clay, then, contributes to the difficulties we face now in studying ancient apprenticeship, and makes the recording of our own experiences even more valuable. As an archaeology student, I really enjoyed making the rill lines instead of studying them for once. I noticed the differences in the rill lines made by my fingers versus the sponge and rib, and realized that with Greek pottery these lines would eventually be erased through burnishing. Most of the ancient pottery I have encountered was not put through so many steps as Greek pottery and it made me consider what other parts of the process are invisible to us. What manufacturing information was erased in the pursuit of perfection? I think we were all a little surprised by the explicit tondo images. After class, I thought about why a painter might want to depict these scenes. It is possible that these cups were meant to be humorous. Silly, and occasionally profane, images and text go on modern coffee mugs, so why couldn’t the Athenians have done the same? Is much known about what they considered “funny”? If so, does this fit in with that description? I also noticed that the clay we are using is rather soft. I wonder if it would be easier to throw thin-walled pots with a less malleable clay. If it is harder for us to mold it, then it may have more structural integrity during the throwing and drying process because it has a greater tendency to resist forces acting upon it. This may decrease the likelihood of a failed pot. However, this may not be the case if the less malleable clay is significantly denser than the soft clay. Thank you Dane for the post! The throwing process was much harder than it looked. I wonder if the ancient Greek apprentices received one-to-one instructions from the beginning of their hands-on experience or were they first allowed to trial and error until they gained a better feel and control of the clay. A primal instinct tells me that if you attempt it long enough, the clay will “guide” your hands to “mold” itself. Dane began to describe some of the compositional elements of the cup illustrations. In early examples, Greek painters remained loyal to the restrictions of the flattest part of the cup, the center of the bowl. This consistency, of only painting images inside the circular band, suggests that the form of the vessel preceded in importance over the painted image. In later examples this hierarchy changes. Painters begin to illustrate the entire bowl, even the curved edges, as well as the bowl’s exterior. This change affects the cup’s shape, which becomes more shallow and flat, almost losing its functional purpose of holding liquid. These two approaches are very different, and it seems we will have to choose either form or image over the other. Because our cups at the museum are earlier examples, favoring form over image, it would seem more practical for our class to follow this hierarchy. I wonder if there is a way to satisfy both elements and produce a painted cup that fulfills the needs of both form and image. Although this may reach outside of the focus of our studies, I think this idea is at least interesting to consider. As potters and painters ourselves, which do we value more? You’re completely right about how some of the images were surprising on those cups (like the vomiting scene), but I’m still completely hung up on how absolutely difficult it was to try and make the clay into any shape other than a lump. The material really does have a mind of its own! After experiencing throwing firsthand, there’s an understanding of the skill that was needed to make these eggshell thin cups over and over. It’s all a bit intimidating. Picking up on something Dane has said about the physical aspects of throwing and what Arthur has mentioned in his comment about the clay being the teacher that “guides” the hand, I think there are some intuitive and less intuitive aspects to throwing clay. At times where I believed I should be applying a certain amount of pressure, Matt would advise me to utilize finesse. And vise versa. As my first time working with clay on the wheel, I can see how the actions can become more organic over time. Also interesting to note is reaching a “point of no return”, where a mistake in the throwing process disfigures the desired base structure that allows you to progress from one stage to another. There is no going back, just scrapping the clay. This is greatly effected by the relationship of clay particles and their uniformity. Great post! When you mentioned the arches of failed pots it reminded me of the way I felt in class. The curved rows like so many gravestones made me actually depressed as if seeing fallen comrades. The clay it is first plopped into your hand is cold, heavy, and unyielding. However, as it spins on the wheel, it warms and forms easily in your hand. It ripples and undulates in a such a fantastic manner that it is no surprise people refer to it as a “living” entity. Also, Hana when you say that the modern equivalent to the elaborate signatures is company logos it makes me think about our own designs. Will we sign our cups? Should we do so in Greek or English characters? Also, they often incorporated the text into the design, like words pouring from the mouth of a person as liquid. We should think about how to make our text part of our picture. Thank you for this post, Dane. You captured the day’s frustrations. The great thing about this class, however, is that we’re forming groups of three. One will be our best potter, one our best painter. The third hopefully has something to bring to the table as well, maybe. Perhaps good people skills. So even if this day was a struggle there is so much to look forward to. Ross’ lecture was my favorite so far, as we use these tondos as a looking glass into Greek culture, which I find shocking and hilarious. And we as 21st century apprentices get to modernize these themes. I loved the ideas we have spit-balled so far: having women, a Coca-Cola logo, a fraternity party scene, red solo cups, Hopkins imagery. Another great post! Last Thursday’s class was definitely frustrating. As someone who is used to working with very forgivible mediums like oil paints, the temperamental nature of the clay was aggravating. I was unsuccessful in creating any sort of bowl-shape, and it wasn’t until towards the end of class that I realized why. I was trying to force a shape into the clay rather than guide the material into the shape that I wanted. In doing so, I was working against the motion of the wheel when I should have been working with it. There is a relationship between the potter and the wheel which I don’t fully understand yet, and hope to gain a better understanding of by the end of the semester. I imagine this is why Ancient Greek apprentices would spend years watching a master throw pots before ever sitting at the wheel themselves.